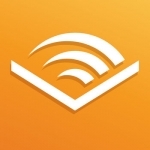 The Audible app offers the chance to access thousands of audiobooks published by Amazon. Its interface is totally suited for people of any technological level as it only has a few controls. Some people may require help from friends or relatives to open their account and buy audiobooks, but once these audiobooks have been bought, their interaction with them will be very independent. Audible is the specific app in which audiobooks created by the same company may be downloaded and listened to. This app is accessible and intuitive and enables books to be handled very effectively, as long as the user is registered with this Amazon service.